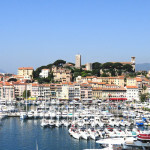 Known throughout the world for its film festival and its many congresses, on arts and communication, Cannes offers the dual advantages of a real international city and a medium-sized town (70,000 inhabitants). Enjoying the privileged climate of the Cote d’Azur, the city provides its guests with the ideal setting for a pleasant stay: the Croisette, the beach, the cafes and their terraces, but also the Suquet (the old town), the fairs of Provence, the old port, the artisans’ area…and all within walking distance of each other. Just off the coast, the Lerins Islands bear witness to the city’s history as well as the splendor of the trees and plants of the Mediterranean area. A flourishing and clean city, Cannes distinguishes itself through its environmental initiatives, which have earned the city the European “pavillion bleu”. All year long, prestigious festivals are open to the public (cinema, television, classical music, guitar, cafe-theater, fireworks, dancing puppets …). The Cannes-Provence Alpes Cote d’Azur Orchestra performs regularly from October to June, regularly featuring prestigious guest artists. The combination of the Ecole Internationale d’Acteurs, the Municipal Conservatory, the Ecole International de Danse (Rosella Hightower), its museums (Musee de la Castre, Musee de la Mer, its Multimedia Center and the College International) makes Cannes an educational and cultural center par excellence. The city of Cannes provides a particularly wide range of sports: two Municipal swimming pools, tennis courts, soccer fields, a golf club of global reputation. A number of competitions are open to sports enthusiasts: triathlon, swimming races across the Bay of Cannes…And from April through October, Cannes offers its fine sand beaches. 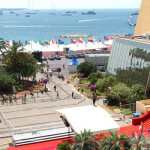 Cannes is conveniently located for those who want to travel. It is 45 minutes by car from Monaco, 1 hour from Italy, and 5 hours from Switzerland and Spain. 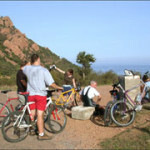 Its climate is one of the best in France (300 days of sun per year). 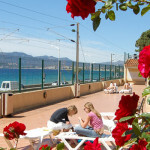 The College International de Cannes is one of the few French language schools in France to include a campus with all the services necessary for student life. In an area of 11,000 sq. mt. 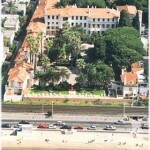 there are 24 classrooms equipped with audiovisual and French language laboratories, 114-room dormitory, dining hall with a 220 seat capacity, library, theater, cinema, a conference hall with 140 seats, cafe-bar with terrace, gym, infirmary, courtyard with a terrace shaded by palm trees, a prime location next to the sea, laundry room with washers, dryers and ironing facilities, parking and public phones. The College International de Cannes also has a multi-media room equipped with 7 computers and a lap-top hook-up for student use. WI-FI internet access is free and available on the entire campus. In addition to its central containment, the College International de Cannes offers other advantages: it helps students from all corners of the world to meet in an environment of mutual understanding and tolerance, exactly as Paul Valery, its founder, would have wished. The French language teaching team at College International de Cannes is made up of 30 French professors holding university teaching degrees. 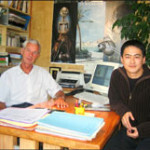 They are trained in the latest teaching techniques and share many years experience teaching French as a foreign language. 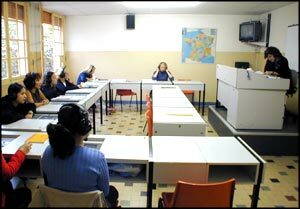 The French teachers have a very lively and efficient teaching approach using original methods and resources. The French Language program guarantees continuity from one level to the other. Integrated into campus life, the teachers are constantly aware of the learning difficulties and progress of each of their students. Each student is required to participate actively and regularly in class, and encouraged to have systematic oral practice in the language. All aspects of the French language are stressed. The Exchange Language Club is based on a very simple idea: drawing on French people from Cannes who want to practice a foreign language. 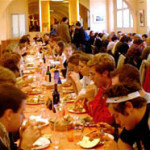 Under this system, participants spend 6 to 8 hours per week together conversing in French half of the time and the other half in the foreign student’s native language. 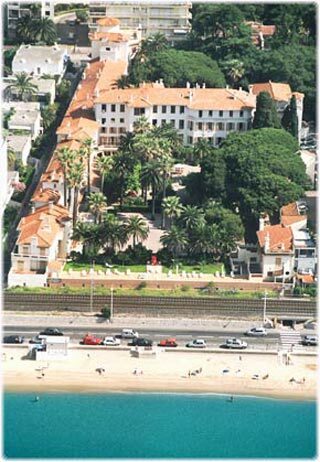 The College International de Cannes is a test center for the exams of the Alliance Francaise and the Chamber of Industry and Commerce of Paris. It also prepares the students for the D.A.L.F. 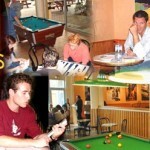 examinations which enable a student to enter a French university. Minimum Enrollment age: 16 years of age (signed parental authorization form required for students under 18). Important: each lesson is 45 minutes long. 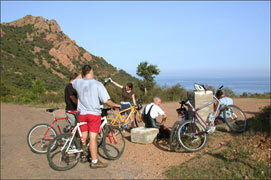 Standard French Courses — Maximum of 14 students per class, 18 French lessons per week. Schedule: from Monday to Friday from 9:00 am to 12:00 pm. All levels from beginner to advanced. Minimum enrollment: 1 week. This is a general academic French language course with a grammatical and a practical component, including written and spoken exercises (presentations, discussions, videos, role-games). The aim is to improve the student’s daily use of the French language allowing them to handle the specific difficulties of the language level in which they have been placed. It is available in 15 different levels. Intensive French Courses — Maximum of 14 students per class, 25 French lessons per week. Schedule: from Monday to Friday from 9:00 am to 12:00 pm plus Monday, Tuesday and Thursday from 1:00 pm to 3:00 pm. All levels from beginner to advanced. Minimum enrollment: 1 week. In addition to the Standard Course there are 3 afternoons of general oral and written practice (according to the level). A different teacher is assigned, in order to allow students to get a different approach and deepen their knowledge they have acquired in the morning class. 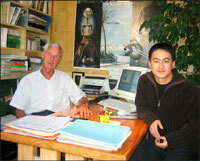 Intensive Plus French Courses — Maximum of 14 students per class, 28 French lessons per week. Schedule: from Monday to Friday from 9:00 am to 12:00 pm and Monday, Tuesday and Thursday from 1:30 pm to 3:30 pm plus one 1:00 pm to 3:15 pm session on Wednesday. All levels from beginner to advanced. Minimum enrollment: 1 week. In addition to the Intensive Course there is one additional afternoon of oral practice in order to encourage the students to speak. Based on exercises and conversations, according to the level. ** Important: there is a surcharge of USD 11 per week for any weeks that fall during high season: 16 June to 10 August 2019. Starting Dates 2019: Full Beginners may only start on the following dates: (dates shown are arrival dates, courses will start Monday morning! ): 6 January / 3 February / 3 March / 7 April / 5 May / 2, 30 June / 28 July / 25 August / 22 September / 20 October / 17 November. NEW: ALL other levels may arrive ANY SUNDAY. Holidays 2019: 22 April, 1 May, 8 May, 30 May, 10 June, 15 August, 1 November, 11 November. Classes lost due to holidays are NOT made up!. IMPORTANT: school is closed from 14 December 2019 until 4 January 2020. 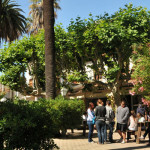 Student Residence: Lodging is located on the campus of the College International de Cannes. Students may choose to have a single room or share a double or triple. There are 114 rooms with 200 beds in all. Each room is equipped with a washbasin; showers and toilets are available on the same floor. Students have to bring their own towels. Rooms are cleaned every day. A refundable key deposit of 50 Euros is required upon check-in, deposit will be returned the last day of the course upon presentation of the key. 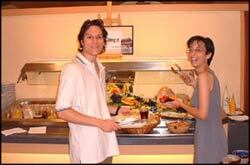 Meals are served in the campus dining room: Half Board is breakfast and lunch on weekdays, with brunch served on weekends. Full Board is breakfast, lunck and dinner on weekdays, with brunch and dinner served on weekends. NEW: a limited number of mini-suites are available on campus. Mini Suites include a private bathroom, air conditioning, and Wi-Fi internet connection. Single or double occupancy. 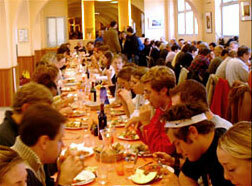 Host Family – Lodging in homestay includes accommodation and breakfast, but students living with families can buy tickets to have their meals on campus. Important Note: students under the age of 18 are NOT accepted in host families, and must stay ON campus at the student residence (see campus accommodation information below). 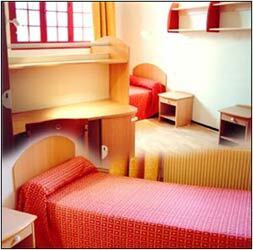 Private studio apartments: Lodging in private apartments is also available. There is also a deposit of approximately USD 400 which is deducted from the final amount. The apartments are studio units (1 room), fully furnished and the price includes electricity and hot water. Linens are provided. Subject to availability! School Residence meals plans are available at additional cost (please request desired meal plans at the time of enrollment): Breakfast: $ 35 per week; Lunch: $ 88 per week; Dinner: $ 79 per week. Airport Transfers: Airport transfers from Nice International Airport to the College Campus on arrival are available and offered at an additional charge of 92 Euros one way. The fee is payable directly on arrival. The College International de Cannes also offers a comprehensive extra curricular activity program to complement their French Courses in Cannes. There is a staff of 5 coordinators dedicated solely to programming activities and entertainment for the students. For each session, the College International de Cannes puts together a program featuring a variety of activities. Evening dance parties, piano bar and game parties are organized and are known to be “high-spirited”. “I had the opportunity to meet people from around the world while learning and improving my French. I enjoyed staying at the college residence in Cannes and hope to continue to learn more French in the future.” Sarah K. – 18 / Student. “I really enjoyed the experience. I met some wonderful people in the program. The school has an effective way of teaching French to beginners. I learned so much. I would definitely do it again!” Ghazzal D. – 25 / Student.